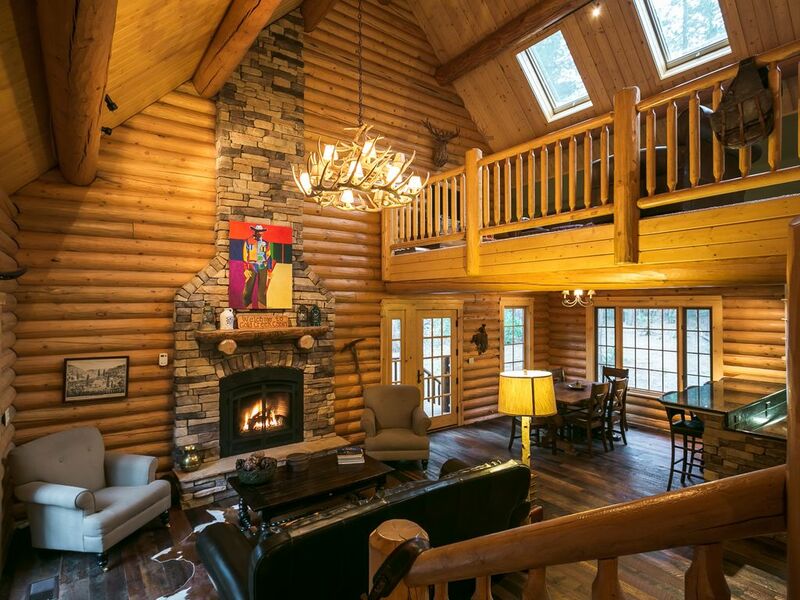 Come stay in a secluded, custom-built, luxury log cabin nestled in the woods. Located on five acres in the heart of California Gold Country, Gold Creek Cabin is only a 2-hour drive from the San Francisco Bay Area and just over an hour from Sacramento. Avoid the I-80 corridor and take the road less travelled. Gold Creek Cabin (3500’ elevation) is perfectly situated near Kirkwood Mountain Resort and Sutter Creek, with easy access to year-round outdoor activities, wine tasting, restaurants, historical gold rush towns, antique stores and the Jackson Rancheria casino. Explore the Gold Country without range anxiety – recharge while you sleep and be ready for another perfect day in the foothills! Main level: Queen bedroom with Nectar bed and pillows, private full bathroom with pebble shower floor; living room with fireplace and cathedral ceiling open to kitchen and dining area; powder room; fully-equipped gourmet kitchen with granite counters and stainless steel appliances. Upper level: Queen bedroom; triple built-in bunk bedroom; full bathroom with tub/shower; open, skylit reading and game loft with space for an air mattress. Private balconies off upstairs bedrooms. Guests assume all liability for use of bunk bed and ladder. Lower level: Queen bedroom; full bathroom with spa shower; recreation room with fireplace, pool table, dartboard and space for an air mattress; home theater with HDTV, Bose audio system and huge DVD library; full-size washer and dryer in laundry room; walkout basement. In the winter, easily access the cabin from the Bay Area even when it is snowing hard uphill at Kirkwood Mountain Resort. Don't risk not being able to get to your vacation rental. Then make the drive to the ski mountain as soon as roads are clear. If roads are closed, enjoy all that Gold Creek Cabin has to offer, such as the home theater with 150+ DVDs, HDTV, dartboard, and pool table. In the summer, plan to quickly get away from the hustle and bustle of the Bay Area with an easy, 2-hour drive into the heart of the California Gold Country. Explore the historical attractions and visit Gold Rush towns like Sutter Creek and Volcano. Take a hike in to the ''potholes'' and relax by the water. Plan to go fishing, boating, biking, hiking, kayaking, and really enjoy the outdoors. Grill on the large wrap-around deck and relax in the Adirondack chairs, enjoying a cold beverage. Sit around the ''instant on'' gas fire pit at night and make s'mores or just enjoy the peace and quiet under the stars. We can help you plan a Gold Country getaway to remember! We were both born and raised in the San Francisco Bay Area, and we still live here, close to family. We love spending time in the outdoors, often exploring the many hiking trails in the East Bay with our two younger daughters. We fell in love with the Sierra foothills during our many road trips to and through the area over the years. When we came across Gold Creek Cabin in the wonderful town of Volcano, we were simply enchanted. Volcano has a lot of history for such a small town, and is one of the true hidden gems of the Gold Country. The cabin has been designed, built and maintained to the highest degree of craftsmanship, and we consider it a privilege to continue its hospitality. At Gold Creek Cabin (3,500 foot elevation), you can stay above the hot valley climate in the summer and enjoy easy access even during heavy snowstorms in the winter. Incredible year-round recreation opportunities in the area include hiking, fishing, and boating in the summer and world-class skiing in the winter. The close proximity to the Bay Area (only a 2-hour drive) allows for stress-free access, without Tahoe-style traffic, via Highway 88. We look forward to sharing Gold Creek Cabin with you! The Cabin has something for everyone: the peace and quiet of a small town, with topnotch restaurants nearby and entertainment at the casino just a short drive away; lots of outdoor activity options to choose from, or just cozy up inside by the fireplace with a mug of hot cocoa. Kids will love the triple bunk bed upstairs, while we love the seasonal creek which bubbles through the property. Bose audio system in recreation room. Harman Kardon Bluetooth speaker in kitchen. Explore the Gold Country without range anxiety - Electric Vehicle charging now available! My kind of roughing it! Amazing location, couldn't ask for better accommodations for my group of eight. We enjoyed sitting on the porch each morning admiring the peaceful views, sipping cappuccino. Trips to local fishing holes - optional, however, this home is a place to feel right at home. The kitchen is well-stocked, there was nothing we lacked in order to prepare meals. Comfortable beds in all rooms and the kids will undoubtedly argue over who gets the top bunk! Looking forward to a winter visit. Thanks Cynthia and Don for sharing your amazing property. We loved having you! Come back soon, this time for fishing! We enjoyed our week in Cynthia and Don’s lovely home. It feels very secluded but is close enough to get to everything you might need. We were lucky enough to get snowed in and stayed cozy by the fire! Relaxing Weekend Getaway in Beautiful Gold Creek! Cynthia and Don are absolutely wonderful hosts, they make you feel right at home and are extremely responsive! The cabin is amazing, perfect for the family (especially if you have kids), with lots to do and see in the area. Kirkwood is just a 45 min drive away, an easy day trip that puts you back at the cabin in time to cozy up to the fire with a warm drink in hand. We'll definitely be coming back to visit soon!! We are so glad you enjoyed your stay! Thank you for being such lovely guests. Come back any time!